So sorry that printing no longer works for you. It's strange to me that more files got altered on your system than on mine. I'm not a programmer, so I'll have to wait for some updates to the printing patch. It seems to work well for Sumatra, but I've been unable to get it to work with anything else; Firefox, Softmaker, etc. 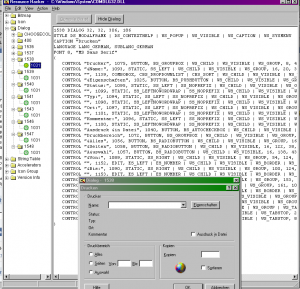 The comdlgex patch corrects a specific problem of some applications requiring a newer, slightly different print dialog than included with W98. The two dialogs are so similar that more or less the data to fill in the dialog fields just needed to be rearranged a bit. The patch fixes the problem of the newer dialog not being recognized on W98 and reformats the data for the old dialog and calls the old dialog instead. This was the problem with Sumatra, I don't think that FF has that problem, [but I could be wrong], I always get a print dialog from FF even before this patch - unfortunately, I don't get much more than that. But that's all that was fixed here, the dialog not popping up. Programs that call the old W98 dialog don't need this patch and won't benefit from it. Programs that failed to show a print dialog will be helped along by this patch. Before the patch was created, KernelEx would stop the error of the new print dialog function not being found, but it didn't show any dialog. It allowed the application to still load and not crash when Print... was selected but didn' t allow printing to occur. Programs that could put up a print dialog won't be helped by this patch. If someone with a little more knowledge of this would care to commnet in case I got it wrong....So yeah the title of the thread includes FF, but the solution on here is only for Sumatra afaik. Hope this helps and clears things up a bit. If someone knows of another application that is actually print enabled by this patch ( or you really got it to fix FF) let us know !! Could you possibly extend LOADDR to also report the preferred base if different? Yes. But I think it best to always report the preferred base. It's added to my to-do list. OK. Here's the new version of LOADDR... It'll detect when the file is a PE file and, if so, provide the preferred load address and the execution and relocation status of the file it's analysing. When the file is not a PE file, however, it'll behave just as the previous version did. AFAIK, only PE files have the preferred load address information. I stupidly had "forgotten" this thread for a long time , but I can report that the newest(?) 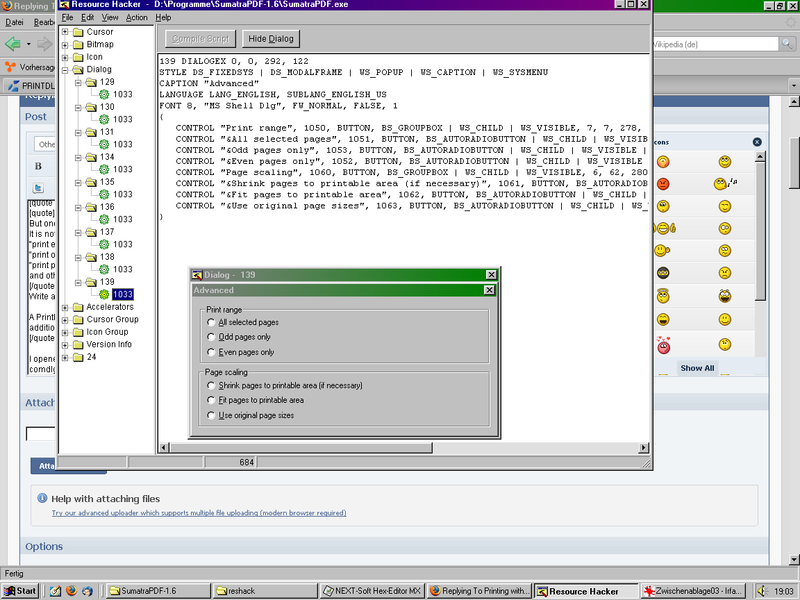 COMDLGEX.DLL (from March 25th 2012, 02:32:34) lets appear the print dialog in many SumatraPDF versions . That means that now newer SumatraPDF versions are usable . The print dialog is the same like in SumatraPDF 0.8.1. The dialog appears not in SumatraPDF versions 1.3 and 1.4. The dialog appears in SumatraPDF versions 0.9, 1.5, 1.5.1, 1.6, 1.8, 2.1.1. I put the COMDLGEX.DLL into the SumatraPDF program folder and "hacked" the file SumatraPDF.exe with HexEdit by replacing the string COMDLG32.DLL by COMDLGEX.DLL (I hope that this was a useful method?). It isn't a big problem that those 2 versions (1.3 and 1.4) do not print, because there are enough other versions which could work. It is not possible to use options like e.g. "print pages 2, 5, 7 [or other] only"
and other, which are probably hidden in some advanced features. I know that the Acrobat Reader 4.0 provided this print features, even in Win98SE. So I suppose that it should theoretically be possible that SumatraPDF provides this options, too. But how? 2.1.1 work great for me. It's the fastest and best of the line and has become my default PDF viewer. > The print dialog is the same like in SumatraPDF 0.8.1. Yes, the visible dialog is still PrintDlg. The data structure is pre- and post- processed to create the PrintDlgEx API. >The dialog appears in SumatraPDF versions 0.9, 1.5, 1.5.1, 1.6, 1.8, 2.1.1. >I put the COMDLGEX.DLL into the SumatraPDF program folder and "hacked" the file SumatraPDF.exe with HexEdit by replacing the string COMDLG32.DLL by COMDLGEX.DLL (I hope that this was a useful method?). ImportPatcher could have been used, but two bytes are easy enough to change in a hex editor. Well done. Write a better dialog box function instead of reusing PrintDlg. A PrintHookProc could help. Or as a stop-gap measure, I can probably enable the "Selection" radio button: if it's selected upon return of PrintDlg, an additional MessageBox can be displayed that asks if you actually want odds or evens (Yes/No), or the document selection (Cancel). 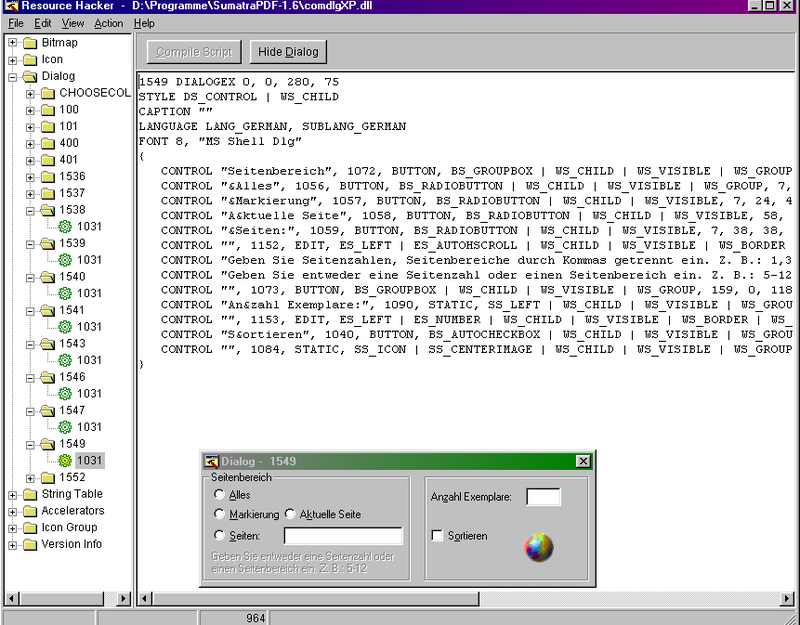 I opened a the original Win98SE-comdlg32.dll with reshack and discovered the print dialog shown by Sumatrapdf (see attachment comdlg32_98SE.png). "print pages 2, 5, 7 [or other] only". - Is it fact that the XP-comdlg32 contains all information about the printdlgex function (or is it not so)? So that it maybe could be possible to "copy" this information anyhow into the 98SE-comdlg32, or into a completely "new" *.dll. Furthermore I've discovered the advanced print dialog in the sumatrapdf.exe file (with reshack). See attached screenshot SumatraPDF_advanced.png below. So it's a fact that this dialog is a part of SumatraPDF and not of any comdlg32.dll. I suppose that it could be possible to call this dialog in any other way than "wanted" by sumatrapdf. But I suppose reshack is not enough to realize this (or any of the other ideas)?! 2.) Has anybody ever found a solution to solve the printing-problem with Firefox 3 with KernelEx? (Maybe transport the printing-function from Firefox 2.0.0.20 to Firefox 3). Sometimes(!) printing worked with Firefox 3, but it was randomly. Absolute lifesaver. Excellent add-on, does exactly what it says on the tin. Used with Fx 3.6.28 on Windows 98SE with KernelEx, it overcomes the printing problem and turns an impossible job into a two-step job. On Windows 2000 it produces good quality pdfs every time. For those who have not yet understood how to use it, either use the menu item under File | Print to PDF ... or customise your Toolbar, and add the icon provided with the extension. I've recently installed FF 3.5.20pre, partly due to need of Java support on the desktop, partly due to severe performance issues with FF 8 and 9 on my 466MHz Celeron laptop (strange, as FF 8 performed very well on my former 333MHz P2, which had FineSSE 29 installed, in case that's relevant). I first installed FF 3.5.19, then copied the 3.5.20pre files over this. Initially, any attempt to print would immediately lock-up FF with an hourglass showing. So I downloaded ComDlgEx from post #27, patched this with Import Patcher so that it called ComDlg00.dll instead of ComDlg32.dll and placed this in the System directory as ComDlg32.dll, having renamed the original as ComDlg00.dll. Now when I attempt to print, the print dialogue appears (it didn't before), but when I click OK, FF again locks up, this time without an hourglass showing. Incidentally, other applications including Opera 12.02 continue to print normally. Also note, the version of KernelEx is 4.5.2 and Kstub 822 is also installed. Edit : Corrected reference to post #22, now post #27. >I've recently installed FF 3.5.20pre.... Initially, any attempt to print would immediately lock-up FF with an hourglass showing. 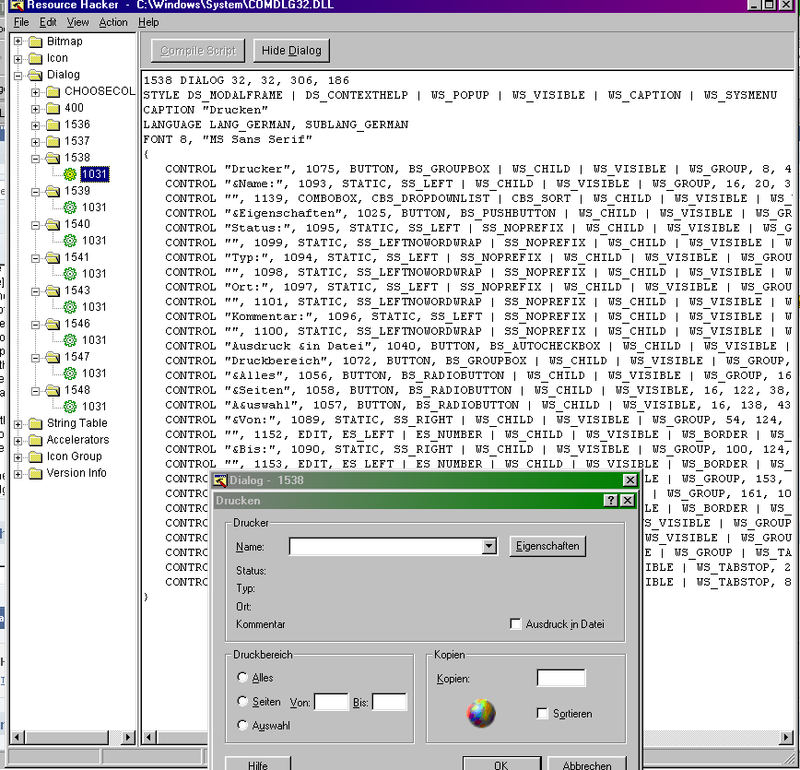 >So I downloaded ComDlgEx from post #22, patched this with Import Patcher so that it called ComDlg00.dll instead of ComDlg32.dll and placed this in the System directory as ComDlg32.dll, having renamed the original as ComDlg00.dll. Both ComDlgEx and ComDlgEx2 from post #22 already reference ComDlg00.dll. There are no references to ComDlg32.dll. Perhaps you patched ComDlgEx.dll from post #27 instead? Also, the code for PrintDlgExA and PrintDlgExW in post #22 is obsolete. See posts #27-28 for details. ComDlgEx from post #27 or ComDlgKs from Kstub730 should be used as a starting point for experiments. >Now when I attempt to print, the print dialogue appears (it didn't before), but when I click OK, FF again locks up, this time without an hourglass showing. >Incidentally, other applications including Opera 12.02 continue to print normally. Also note, the version of KernelEx is 4.5.2 and Kstub 822 is also installed. If you could walk FF3 (with dependencies) through IP35, I'd like to see the .ini file (inside a spoiler would be great). Also, check if printing with Opera 12.02 adds anything to the Kexstubs log file--it may not be using PrintDlgEx. As always, thank you for experimenting and reporting your findings. Unfortunately I can use only these because with everything that came after that, incl. Kext, I was not able at all to print from SeaMonkey !!! I had a look but didn't find 'ComDlgKs.dll'. I had probably uninstalled KernelEx and re-installed it for some reason (I do that sometimes). However, no "Options message box" (I presume that means the "print dialogue"?) had appeared. Neither had there been any new entry added to the KStub822 log file, as far as I could tell. I added the missing 'ComDlgKs.dll', and now (remember, I have the comdlg32 hack in place at this point) FF once again locks up instantly when I try to print, no "print dialogue". Furthermore, I can confirm that no entry is added to the KStub822 log file. Next I reversed the comdlg32 hack and the FF printing behaviour didn't seem to change. Sorry, my mistake. That was the post #27 version. I've corrected the previous posting. @MiKl: What version of SeaMonkey are you using? See posts #31-33 for SeaMonkey reports. @Joe: I'm not seeing any indication that FF35 calls PrintDlgEx to print. So the presence of ComDlgKs.dll shouldn't make any difference. Please search the FF35 app folder for the text "PrintDlgEx" (else "PrintDlg"). You can also try contents=std,Kstub822,kexbases,kexbasen if "PrintDlgEx" is found. Edit: I just downloaded and extracted Firefox 3.5.19, SeaMonkey 2.6.1, and Opera USB 12.02. Searching for text, I found that all contain "PrintDlg"; none "PrintDlgEx". My ComDlg?? solutions should have no effect on printing in these apps. Well, as you've found, the string "PrintDlgEx" is not to be found in any file within the FF 3.5 directory. Also, I changed the KernelEx "core.ini" per above and this had no effect (on this issue), which is to be expected. However, despite all this, the "ComDlg32.dll" hack does have some effect. Without it, FF hangs instantly when printing is attempted (showing an hourglass). With it, the print dialogue appears, and if you cancel at this point, FF appears OK. I've just reconfirmed this. However, despite all this, the "ComDlg32.dll" hack does have some effect. Yepp, I have your comdlg32 from 3/21 in the Seamonkey folder and comdlg32 from 3/13 in the KernelEx folder. Only in this combination I have good results when trying to print from Seamonkey 2.0.14. !! Of course, sometimes it chrashes - but overall it is quite reliable.